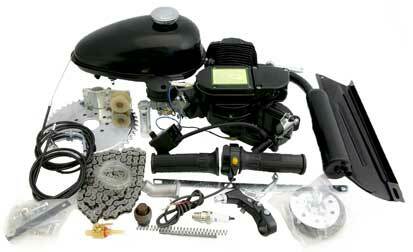 All our motorized bicycle engine kits comes with everything but the gas and oil. Convert your men's 24" - 26" bicycle to a 20-40 MPH and 100-150 Miles per gallon machine. 2 Stroke Motors require oil mixed in with the gas. 16 to 1 (8oz per Gallon) when motor is new and 32 to 1 (4oz per Gallon) after break in period (about 1 or 2 tanks). You can still pedal bike like normal with clutch lever held in or locked in with button. To start a 2 Stroke Bicycle Motor just hold in the clutch and pedal to get some speed then release the clutch to "Bump Start" the motor and off you go. To come to a stop once engine is running you can hold in clutch and engine will idle. Push Kill Switch on throttle to kill motor, clutch must be held in when bike is in motion or motor will keep running. Engine kit will add about 24 lbs to your bike. Fits most standard V frame Men's 24" and bigger, we suggest 26". Engine kit is about 8.5" height 7" length 5" width. Kit fits on standard 25mm - 29mm frame tube. Larger frame size requires drilling into bike frame and use the universal motor mount..
Operating this motorized bicycle or bicycle engine kit involves some risk of serious bodily injury . Buyer accepts responsibility for any and all vehicle operation that may lead to personal injury, economic loss, social distress, other losses, costs and damages. Not all motorized bicycles are permitted for road use. Check with your local Vehicle Insurance services for requirements. We do offer any guarantee for legal road use. Although this kit fits MOST bikes, we cannot guarantee that this kit will fit your individual bike. Returns due to size are not accepted. China bike engine factories have always advertised their biggest engine as 80cc. However, the bore and stroke of an 80cc being 47x38mm only equals 66cc. Therefore there is no such thing as an 80cc Chinese bicycle motor and it truly does not exist. This is the biggest motor available. Installation can take a few hours or days, take your time and don't rush. Install chain, a few links might have to be removed to fit your bike exactly.